Hail has hit a several areas of Minnesota, including Southwest Minnesota. For those that have not yet seen the article, U of MN Extension recently released revised information on assessing damage and yield loss: Hail damage to corn and soybean. For some farmers and their advisers, the damage is severe or light enough that decisions are easy. For others, in a couple days there will be indecision and a desire to try to help the crop out. In addition to the loss of photosynthetic area, stem bruising and callouses can lead to yield and late-season stem/stalk breakage. In the case of corn, injury to stems can lead to later infestations by sap beetles, and infestations of migratory armyworms are often worse in grassy corn or lodged cereal grains in areas where hail has occurred. Bacterial soft rots, Goss’s wilt and several other diseases can be increased by hail. Soybeans may see increased incidence and severity of bacterial blight. Few, if any, of these problems are affected by fungicides. Any insect problems can be best dealt with by scouting and dealing with problems based on risk. Diseases and "plant health," that elusive agronomic unicorn, might require a more proactive approach. Fungicides after hail - An investment in profitability or just another economic stimulus program? Just because you can do something, does not mean it will make a difference in crop yield. Fungicide applications to hailed corn and soybeans are a case where someone’s bottom line will always be improved, but it may not necessarily be the farmer's. Dr. Dean Malvick, Extension plant pathologist, provides information on the question: Do foliar fungicides provide benefit to corn damaged by hail? This article was also linked to in the above hail damage article released yesterday. In some cases, we do see yield responses to fungicide applications to corn and soybeans. However, these are later, reproductive stage applications and most often associated with a particular fungal disease. With the current crop prices, you may want to think a bit before you start calculating. It may be worth considering whether applying an application now, with a less certain chance of economic return, outweighs the "wait and see" approach with a later fungicide application. Nevertheless, it is hard to prove a negative and so some may feel it is worth a shot to apply a fungicide. This is a business management decision that only you can make. This spring, Paulo Pagliari and Bruce Potter developed some guidelines for setting up on-farm experiments and an EXCEL spreadsheet for you to use to calculate whether your yield differences are enough to hang your hat on and your investment paid. They can be found in How to do research on your farm. Dean Malvick and Bruce would be willing to combine your spreadsheet results with others to get a more complete picture of whether fungicide applications to corn or soybean damaged by hail are providing any benefits. 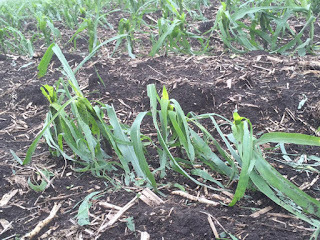 For other articles on hail damage, visit U of MN Crops Extension webpage.